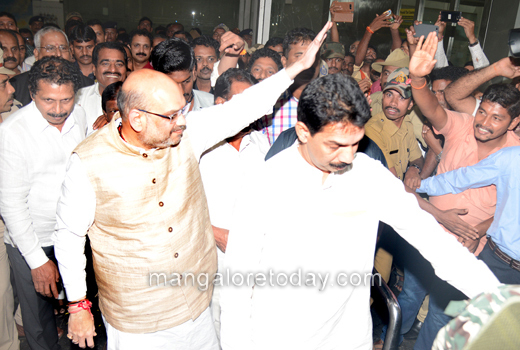 Mangaluru, Oct 3, 2017 : BJP National President Amit Shah who as scheduled to arrive in Mangaluru on October 2 at 6 pm and participate in a vehicle rally upto Talapady, however arrived almost seven hours behind schedule, at around 1.15 am by a special flight. It has been gathered that Shah was preoccupied with the Gujarat Gaurav Yatra in his home state. 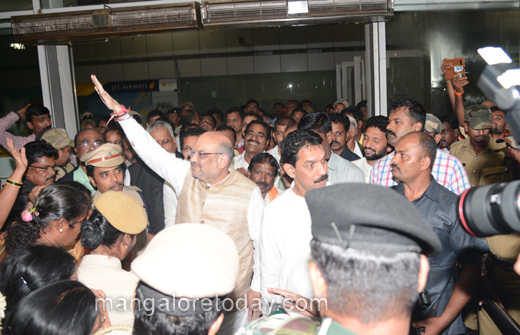 Several BJP leaders including Dakshina Kannada MP Nalin Kumar Kateel, District BJP Chief Sanjeeva Matandoor, Krishna Palemar, Mallika Prasad, Nagaraj Shetty and others who were present at the airport extended a warm welcome to the party supremo. 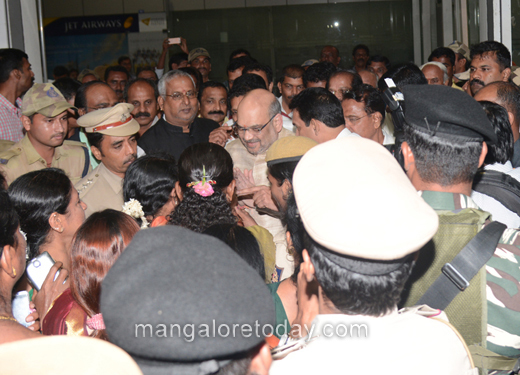 Shah later proceeded to Kerala where he will be participating in a Padayatra today. He is expected to return to the city this evening . Shah will be holding a meeting with BJP leaders and office bearers at Hotel Ocean Pearl at 10 am tomorrow, followed by a meeting of BJP workers at TMA Convention Centre.